Note: Because I skipped a day of the Ornament Advent Calendar, and because I received a beautiful new ornament as a Christmas gift this week, I am doubling up on today’s posts with the help of my good friend Natasha. She wanted to write a piece about the ornament she sent me, to explain the motives behind her choice. Here is her guest post. I’m going to call it post #21. My post about the ornament will be up later today, and will be #22. You know what I mean. Fraternal twins that look so much alike you wonder if they’re identical. But if you look hard enough, you can see the differences. Admittedly, our ornaments are more obviously different than some of those twins. 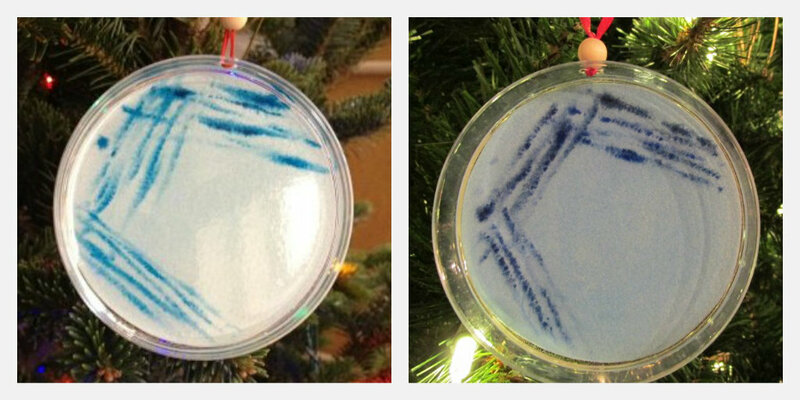 Jen’s ornament is dark blue on dark blue. My ornament is dark blue on light blue. Totally different. The pattern on the ornaments is the same though, and that’s most of what matters here. For most people, this pattern is just some strange streaks down the left side. However, once I laid eyes on it, I knew Jen had to have it for the pattern. And so did I.
I had to get this for Jen because she’s undoubtedly done this a million times. (I’ve probably only done this a half million or so.) Because she’s a total science geek, just like me. Because it’s beautiful in it’s own right, but there’s like a little secret hidden in the art if you’ve been there. Because we have a similar background with a lot of shared experiences, and I realized this could give us a tangible link to those shared experiences that we mutually geek out about regularly. I hope she takes it on that cruise she’s always talking about and shows it off. Natasha and I are long-time Internet buddies. We try to get together in reality sometimes, but we live far apart. Still, we talk a ton online, and I think we get along so well because we both like to geek out over stuff in our own ways. She runs a blog of her own, MetaCookbook, where she discusses food, science, and beer, and treats her readers to some fascinating blather along the way. I encourage you to check out her stuff. She’s not a recipe blogger, and she’s not a rabid granola foodie. She’s just someone who loves food, from growing it to eating it to the communities it can build. She’s funny and smart and real and I get mad at her when she leaves the blog un-updated for more than a week. That should be enough information to get you over there for a look!